Asymmetric and parasitic conjoined twins are rarer anomalies of monochorionic monoamniotic twins, consisting of an incomplete twin attached to the fully developed body of the co-twin. A 30-year-old multigravid woman referred to maternal fetal unit due to polyhydramnios at 28th week of gestation. 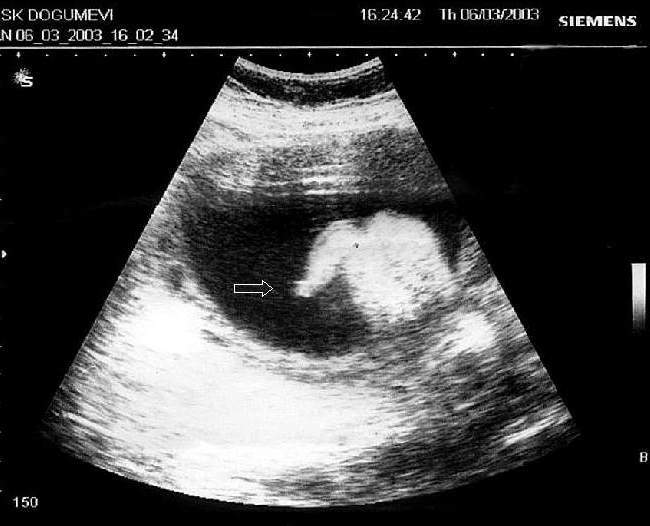 Sonographic examination revealed a single fetus and polyhydramnios with amniotic fluid index 30 cm. The fetus had normal apparent single head, spine, thorax, abdomen, two upper and two lower limbs, and two relatively well developed rudimentary parasitic lower limbs at sacral region. Lower limbs of the autosite were moving freelly but no movement was detected at the parasite. The parasite contained irregular lower limbs and left foot with three toes. Short and deformed long bones were also present in the parasitic limbs. A Cesarean section was performed at 38th week of gestation and a live female infant weighing 3600 g was delivered. The parasitic lower limbs were totally excised. Post-operative period was uneventful and the newborn was discharged as healthy. Post-natal follow-up was normal at nine-month-old. Pygopagus tetrapus parasitic twin is a rare form of conjoined twins and in utero diagnosis with ultrasound assists in prenatal management and counselling with parents. Conjoined twins are rare, with an estimated frequency of one in 50,000–100,000 births . Asymmetric and parasitic conjoined twins are rarer anomalies of monochorionic monoamniotic twins, consisting of an incomplete twin attached to the fully developed body of the co-twin. 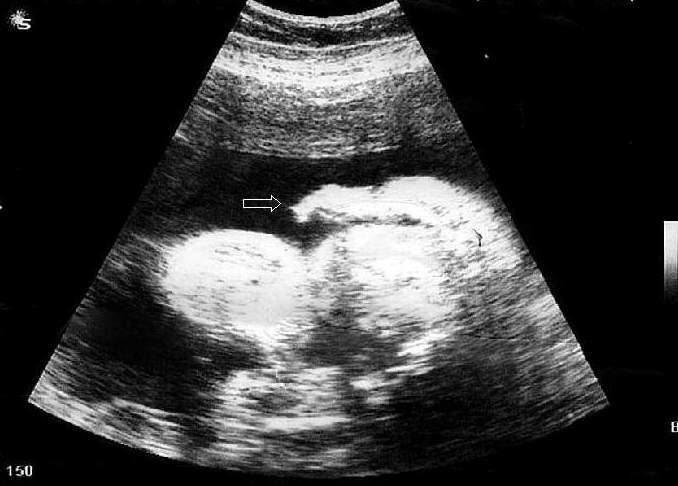 Prenatal diagnosis of conjoined twins with B-mode ultrasound (US) [2, 3], computed tomography (CT) , three-dimensional US [5, 6], and magnetic resonance imaging (MRI)  has been reported. Parasitic conjoined twin diagnosed in utero was presented in few cases previously [7, 8]. But literature review failed to identify a case of pygopagus tetrapus parasitic twin detected in utero. We report a case of pygopagus tetrapus parasitic twin diagnosed at 28th week of gestation and delivered a live baby at term. A 30-year-old multigravid woman referred to maternal fetal unit for targeted ultrasonography due to polyhydramnios at 28th week of gestation. The woman had no family history of congenital anomalies and had taken no medication during her pregnancy. Her obstetric background consisted of two first trimester abortions and a healthy live birth at term. Screning for gestational diabetes was negative. Sonographic examination initially revealed a single fetus and polyhydramnios with amniotic fluid index 30 cm. The fetus appeared normal except a mass at sacrum. Further evaluation with US identified that the fetus has normal apparent single head, spine, thorax, abdomen, two upper and two lower normal limbs, and two relatively well developed rudimentary lower limbs at sacral region (Figure 1 and Figure 2). Detailed anomaly scanning of the autosite with US revealed normal findings except the parsite at sacral region. Lower limbs of the autosite were moving freelly but no movement was detected at the parasite. The parasite contained irregular lower limbs and left foot with three toes. Short and deformed long bones were also present in the parasitic limbs. The parents were counselled and were informed by a multidisciplinary team of the perinataologists, the neonatologists and the pediatric surgeons. Transverse section through fetal sacral region shows parasitic left lower limb at 28th week of gestation. Sagittal section through fetal lumbar and sacral vertebra demonstrates parasitic left lower limb at 28th week of gestation. A Cesarean section was performed at 38th week of gestation and a live female infant weighing 3600 g was delivered. The placenta was single and normal. The Apgar scores were 8 and 10 at 1 and 5 min, respectively. The infant appeared to be normal except the parasitic co-twin (Figure 3 and Figure 4). The infant was further evaluated with US and MRI that confirmed that parasitic conjoined twin had no relation with the spinal cord or related structures. One weeks after birth, the infant underwent surgery. The parasitic lower limbs were totally excised. Post-operative period was uneventful and the newborn was discharged as healthy. Post-natal follows-up were normal at nine-month-old. 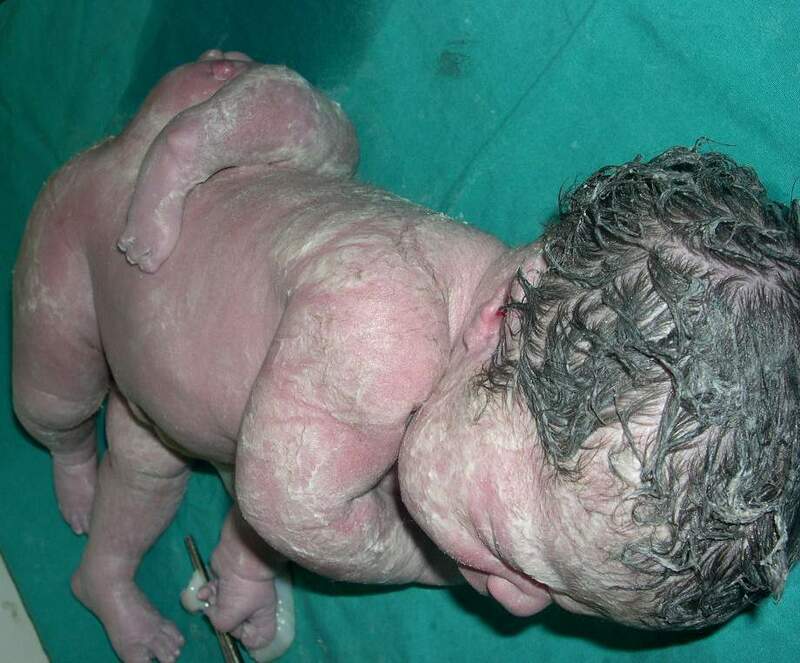 The baby with parasitic left lower limb, at delivery. The baby, at early neonatal period, has parasitic left and right lower limbs. Pathologic examination demonstrated skin covered parasitic body. Two deformed lower limbs were attached to the sacral mass. After dissection of the mass and the parasitic limbs, long bones of bilateral lower limbs and some pelvic bone were seen. Conjoined twinning is a fascinating congenital abnormality with devastating consequences for the twins and the family. Conjoined twins develop from a single fertilized ovum and result from failure of the division of the embryonic disk until after day 13 from conception. Seventy percent of conjoined twins are female, and 40% are stillborn . Conjoined twins are categorized based on the region of connection. In one attempt to universalize the current nomenclature of conjoint twins, Spencer  proposed a simple and logical new classification based on the theoretical site of union (Table 1). Parasitic twins are rare form of conjoined twins and are consisting of an incomplete twin (parasite) attached to the fully developed body of the co-twin (autosite). It is classified  as (1) an externally attached parasitic twin, (2) an enclosed fetus in fetu, (3) an internal teratoma, or (4) an acardiac connected via the placenta. Classification of conjoined twins based on the theoretical site of union . Prenatal recognition of conjoined twins and precise characterization of the malformations are required for optimal obstetric management. Currently, sonographic diagnosis of conjoined twins may be straightforward if fusion of fetal parts is obvious. In utero diagnosis of conjoined twins was reported previously [2–5]. But prenatal diagnosis of parasitic conjoined twins is relatively difficult becasue of changing fetal positions and the rarity of these abnormalities as with any rare medical entity. Parasitic conjoined twins identified at birth were reported [11–15], but so far two cases diagnosed in utero with US and MRI were presented in the literature [7, 8]. Sonographic findings in conjoined twins include inseperable fetal bodies and skin contours, no change in the relative postions of the fetuses and shared organs. Polyhydramnios is a secondary finding that occurs in 50% of conjoined twin pregnancies [15, 16]. Hence the site and extent of twin fusion are variable, a careful evaluation with US may help to identify parasitic conjoined twins in utero. Differential diagnosis includes parasitic twin, fetus in fetu (internal parasite) and teratoma. Presence of rudimentary lower limbs with foot in our case suggested the parasitic conjoined twin. The prognosis depends on the site and extent of twin fusion. In our case, during routine prenatal examination, the woman had three US scanning and had no abnormal findings noted until she was referred for polyhydramnios at 28 weeks' gestation, suggesting that prenatal diagnosis is relatively difficult. Rarity of the condition may lead to misdiagnosis or undiagnosed. Although our case was referred for detailed US due to polyhydramnios, its etiology is not clear and parasitic site might have vascular malformation that may lead to increased volume of circulation, like in the cases having teratoma and arteriovenous malformations. Hyperdynamic cardiac activity and increased cardiac output might casued polyhydramnios in our case. Even though it is rare, a parasitic conjoined twin should be considered in the differantial diagnosis when polyhydramnios is present. Prenatal diagnosis in our case helped in counselling with the parents and in management of the case and delivery. In conclusion, pygopagus tetrapus parasitic twin is a rare form of conjoined twin with a favorable outcome. Obstetrician should be aware of the existence of a parasitic twin during prenatal examinations and the importance of the differential diagnosis of parasite and teratoma. Delivery at a tertiary center is highly suggested for optimal neonatal intensive care and pediatric surgical intervention. "Written consent was obtained from the patient for publication of study"
AG was consulting perinatologist associated with the case and drafted the manuscript. HA was consulting perinatologist and participated in the design of the study. YC was chief director of maternal and fetal unit, and participted in its design and coordination. All authors read and approved the final manuscript.